… At least, not in the way you think they are. And it’s a tough pill to swallow for copywriters and bloggers everywhere. But it’s true. Less than 16% of people read web pages word by word. We don’t read on the internet. We skim. We scan. We hunt out the important bits. I’m telling you this because you can’t start writing web copy unless you know how people are going to read it. Focus your energy on the few words that do matter. Use irresistible titles and headers. Use highlighted keywords throughout your text. Use clear, concise sub-titles (don’t be funny or clever, just get to the point). Stick to short, simple paragraphs. You’re probably wondering why I’ve written a 1,000 word article explaining the pointlessness of writing words on the internet. The irony is not lost on me. But, there is a very good reason, and I’ll explain at the end. Let me just say this; copywriting is more than just keywords and catchy titles. For the 38% who will be leaving us here, take care! For the rest of you, let’s dive into this weird phenomenon in more detail. Why Is No-one Reading My Copy? You could get F. Scott Fitzgerald to write your web copy, and people would still skim it. Internet users are in a hurry. Think about your own internet use. You go online because you’re looking for something specific. You’re looking for answers. You skim and scan until you find it. But here’s the important part. We almost always stop at the first answer. Put your most important copy right at the top. Make it the first thing they see. This isn’t a novel. Don’t spend ages setting the scene. Give us information right now. That means using irresistible titles and headers. Capture attention and answer questions immediately. And do it right at the top. Let’s look at some eye-tracking test results to understand why. According to eye tracking studies, we don’t even read sentences like normal sentences. You probably read this one backwards. We don’t read anymore, we sweep backwards and forwards, and then down the page. 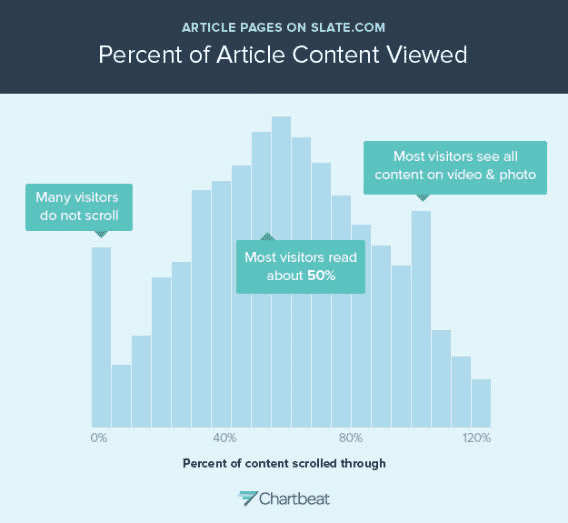 Eye tracking studies show that most web pages are digested in an F-pattern. We read the headline and the introduction sentence. So make sure they’re compelling. Then we start moving down the page looking for keywords. We stop briefly when we see an intriguing word. Then we scan the other words around it. Is that paragraph useful? No? Time to move on. This is why keywords! (made you look) are so important. Litter your text with sharp, focused keywords, and follow them up with useful information. More bad news, I’m afraid! Because of this ingrained F-shape reading pattern, if your best copy is centred in the middle of your web page, people won’t find it. Gerry McGovern explains how only 1 person out of 15 could find a prominent piece of text when placed in the central column. Only one person! When it was right in front of them! Instead, users scan to the left hand side of the page to look for useful keywords first. It’s where the informational copy should be. It’s internet instinct. The left-hand side and the top of your page are prime copy real estate. …And 50% leave before they reach half-way. We’re already 600 words into this article, which means most of you are gone. But the real kicker is that a huge portion only see above the fold. This is where you best copy should live. As for reaching the end of your latest article? Less than 25% even get to the bottom. But hundreds of people shared my article on Twitter. They’re definitely reading it. 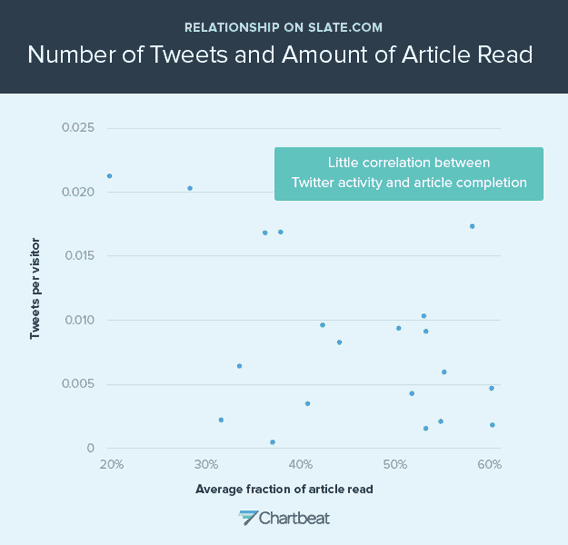 The guys over at Slate.com ran an experiment to see how sharing correlated to article completion. Ie, did people share the article when they got to the end? Their results showed that there is no correlation at all here. Some people tweeted at the end of the article. But just as many tweeted before they’d even scrolled down. They liked the sound of the headline, so they tweeted. The keywords clicked with them, and they liked the sound of the introduction. Tweet! Essentially, it doesn’t always matter what you put at the end. Put the good stuff at the beginning anyway. It’s all about the first impression. It’s the soundbites. It’s instant answers. So, at the beginning of the article, I told you that there is a good reason for writing such a long article online. Why am I doing this when I could have just left the bullet points at the top? Yes, 84% of people have already taken big juicy chunks out of this blog and left without reading everything. They devoured the keywords, and maybe took home one or two good points because I highlighted them and wrote catchy subtitles. But, there are still 16% of you with me. 16% read every word and got to the end of the blog. This is why I write long-form content. Because those 16% are your most important readers. If 1000 people opened this web page, then 160 have made it to the end. Hopefully that 160 learned some real in-depth stuff, rather than wandering off with a few soundbites. If you reached the end, you hopefully like my tone, and my ideas. You’ll hopefully read some of my other blogs. Maybe you’ll bookmark me or follow me. That is how you use copy to power your business in a long-term way. Yes, copy is about capturing attention and intriguing people at first sight. But, it’s also about making a deeper connection. It’s exchanging real value, and forming a relationship. And just think, only 16% of you will find out the real point of this article. But can you also make a connection? Can you use copy to form a relationship, and empower your readers and customers? Now you know how people read on the internet. In the coming series, I’ll show you how to use this knowledge to write copy that works.